1) Tube size (D*F): Φ47*1500mm, Φ58*1800mm. 4) Outer tank material: SUS304 food grade stainless steel or powder coated color steel sheet. 5) Inner tank material: SUS304 food grade stainless steel plate, the thickness is 0.4mm\0.5mm\0.6mm. 6) Bracket material: Stainless profiled SteelSteel with surface plastic painting. 7) Heat Preservation layer: 55-60mm improved polyurethane integral foaming, superior heat preservation. 8) Temperature when exposed to sun without water: 250, 2.5 hours to boiling if using single tube. 9) Absorb rate: =93%, thermal radiation rate: 6% (100). 10) Optional Electric Heater: 1500w/3000w. 11) Resist 25mm hail, using life can last 15 years. 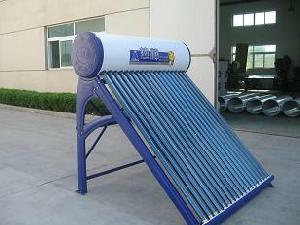 Compact non-pressure solar water heater.